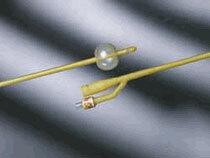 Bardia single-use, sterile 2-way latex Foley Catheters. A Silicone-elastomer coating provides protection against urethral irritation. Comes in an individually wrapped peel-pouch. Catheter Size 14 Fr.,16 Fr.,18 Fr.,20 Fr.,22 Fr.,24 Fr.